Analysis of ancient human skulls found in southeastern Brazil are providing new insights into the complex narrative of human migration from our origins in sub-Saharan Africa to the peopling of the Americas tens of thousands of years later. 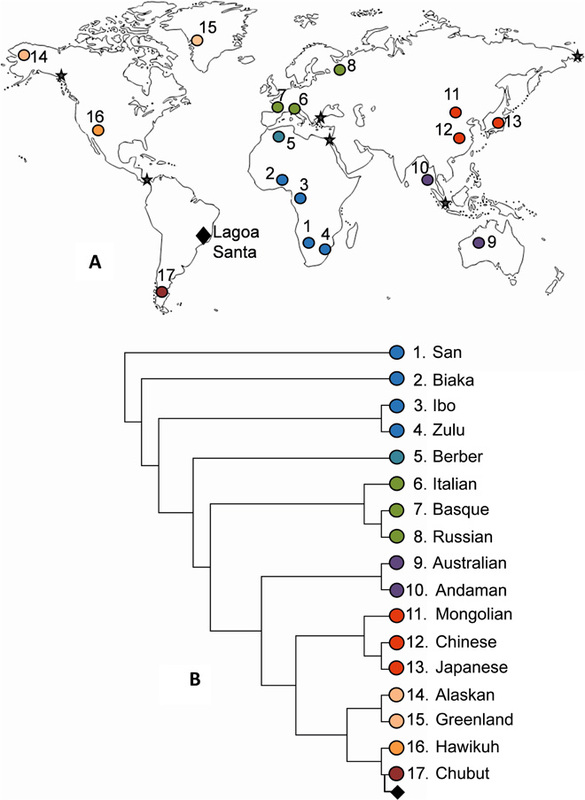 The many differences in cranial morphology, the study of skull shape, seen in Paleoamerican remains found in the Lagoa Santa region of Brazil suggest a model of human history that included multiple waves of population dispersals from Asia, across the Bering Strait, down the North American coast and into South America. The findings published Feb. 22, 2017 in the journal Science Advances suggest that Paleoamericans share a last common ancestor with modern native South Americans outside, rather than inside, the Americas and underscore the importance of looking at both genetic and morphological evidence, each revealing different aspects of the human story, to help unravel our species' history. Geographic and historical relationship between populations. "When you look at contemporary genomic data, the suggestion, particularly for South America, was for one wave of migration and that indigenous South American people are all descendants of that wave," says Noreen von Cramon-Taubadel, an associate professor of anthropology at the University at Buffalo and the paper's lead author. "But our data is suggesting that there were at least two, if not more, waves of people entering South America." How people settled the Americas is a debate that has continued for years in the scientific community. It's now clear that the first human entry into the Americas began at least 15,000 years ago and dispersed quickly into South America following a coastal Pacific route. Map showing the geographic position of each contemporary population and the Paleoamerican sample from Lagoa Santa (Brazil). Stars denote the waypoints used to calculate more realistic geographic distances between populations. (B) Tree topology representing the hierarchical model of historical divergence among populations. The null history model places the Paleoamericans as a sister group to their nearest geographic neighbor (Chubut, Patagonia). The conundrum of conflicting data between morphology and genetics is among the issues fueling the debate of how people first entered the New World, but von Cramon-Taubadel's conclusions are similar to previous morphological research while also relying on a pioneering method to reach those conclusions. "We've adopted and modified the method from ecology, but to my knowledge this method has never been used in an anthropological setting before," she says. In the past, researchers have looked mainly at the overall similarities between the morphology of prehistoric skeletons from the Americas compared with the morphology of living people. Models of dispersal, each with a different number of waves that attempt to match existing data, have also been used. But von Cramon-Taubadel's current research with Mark Hubbe, an associate professor in the Department of Anthropology at Ohio State University, and University of Tübingen researcher André Strauss, doesn't make any previous assumptions about dispersals. It looks at an existing population as descendants of many possible branches of a theoretical tree of relatedness and then uses statistics to determine where in the tree their sample best fits. This method has the advantage of not needing pre-determined models of dispersal but rather considers all possible patterns of relatedness. All living people, von Cramon-Taubadel explains, have a common ancestor, but not all fossils necessarily contribute to the ancestry of living people. Some populations of modern humans did not survive or made only a marginal contribution to living people. So fossils of these extinct humans provide few clues about the ancestry of living people. "There are other fossils, particularly in the Americas and Eurasia where at the moment we are not 100 percent sure how they fit into the human picture," von Cramon-Taubadel says. "We could use this method to elucidate where they sit and to what extent those populations actually play a role in the modern ancestry of people in those areas."